All Translink buses have bike racks. Metro Vancouver 2010. As a car-free resident and cyclist living in downtown Vancouver, one has to resist the strong temptation to document(or rant) on daily detritus on more changes to road closures, more bike route diversions, more tent raising and more events before, during and after the Olympics. There will be many different themes on the Olympics in blogsphere, with some topics on cycling, transportation, people movement and public space. Since the experience of living in an Olympic city has yet to finish, either a blogger must patiently wait for story theme to emerge after several mini experiences or track a haphazard jumble of daily observations. For the next few weeks, we hope to straddle between both extremes. We will offer photos and observations on Olympic city life — but not just on cycling, public space and sustainable communities. We just want to share with you snippets of daily living surrounded by the Olympics in our neighbourhood. So join us now, on the Cycle Write Blog. No big deal. Most of the time, it is not a big deal for us after being car-free for many years and for over 40% of car-free residents living in the West End and Yaletown. Both areas are high density neighbourhoods. To own an underground parking spot in downtown residential buildings, can now cost over $30,000 – $50,000. Bikes on ferry. Granville Island, Vancouver BC 2010. Photo by J. Chong. Last week TransLink conducted an informal online poll with a fun question: “How do you feel about your car?” Not surprisingly since Buzzer Blog newsletter is for folks who are transit users, 53% respondents indicated they did not have a car. Now with new Canada Line stations complementing Skytrain stations downtown plus increased network of bike lanes and paths, downtown Vancouver is even better served for non-car, multi-modal transportation options – ferry, cycling, walking, bus, light rail and the Olympic streetcar line. Incidentally, the latter seems quite popular. 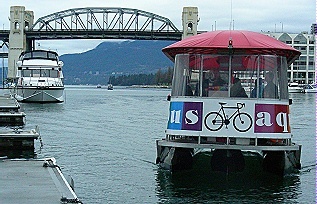 We regularily see people piling in and out of the free streetcar while we are on our bikes by Granville Island. Even Amtrak has added a second daily train from Aug. 2009 to Mar. 2010, between Seattle and Vancouver which takes passengers directly to each city’s downtown area. So try being car-free for some trips during the Olympics. City of Vancouver. Transportation: Ecodensity’s Connection to Transportation. (Accessed Feb. 2, 2010). TransLink. How do you feel about your car? In Buzzer Blog. Week of Jan. 31, 2010. Being car-free during the Olympics was not so trying but using a bike to accomplish the goal was another story. Because planners rarely think of bikes when setting up such an event we have major bike corridors such as False Creek, Coal Harbour, Strathcona and so on being summarily closed.